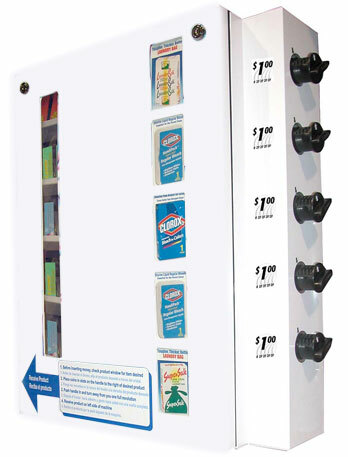 Six Selection Machine dispenses up to 240 medicine, condoms, wipes, OTC in their original single dose packets. 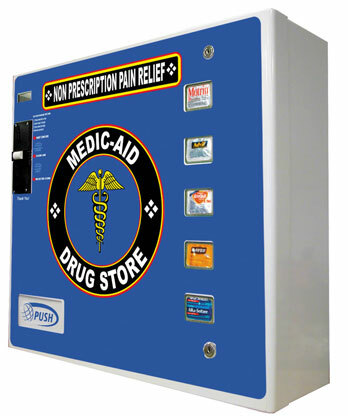 Can also dispense ear plugs, safety glasses, hair nets, cough drops, first aid kits, etc. Six separate heavy duty Steel Coin Mechanisms with exclusive all Steel Knobs allows individual pricing of products. Accepts up to 4 coins such as: $.50, $.75, $1.00 . Available for most Canadian and other International coins. Dimensions of the machine: 24 1/4″H x 22″W x 4 1/2″ D Weight: 43 lbs. Machine is ready to be Wall Mounted, or opt for the Pedestal Base Stand. Most versatile Feminine Care Plus Machine on the Market! Can vend up 33 Sanitary Napkins or 51 Tampax Tampons in addition to 37 medicine packets or condoms. The dispensing coils can be quickly changed to offer any combination of these products. For example each of the three shelf can hold 11 Sanitary Napkins or 17 Tampons. Dimensions of the machine: 24 1/4″H x 22″W x 4 1/2″D Weight: 38 lbs. Machine is ready to be Wall Mounted. 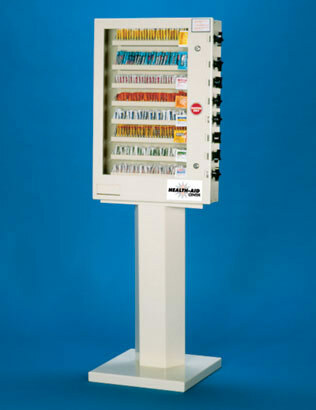 Selection machine dispenses 128 medicines in their original single dose packets. Four separate steel coin mechanisms allow individual pricing of medication. Dimensions of the machine: 16″X19″X4″ Weight: 33 lbs. Ready to be wall mounted. Pedestal stand available below. 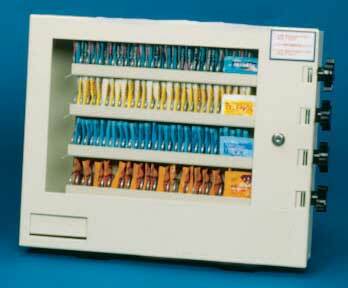 Eight selection machine dispenses 272 medicines in their original single dose packets. Dimensions of the machine:24″X19″X4″ Weight: 66 lbs. Features Electronic LCD Display, Touch Pad Selection Keys,Programmable Vend Counter keeps track of product usage. and Golden Dollar-Each selection programable up to $95.99! Dimensions: 24″H x 26″W x 8″D Weight:53lbs. No stands are available with this machine.